Intelligent voice-based assistants like Alexa, Siri, Echo, Cortana etc. are also proving an inspiration for the pioneers of service robotics. What was deemed unthinkable a few years ago is now the subject of intensive discussion thanks to the use of artificial intelligence. Rather than every slight movement having to be painstakingly programmed, in future service robots will simply imitate the actions of human beings. 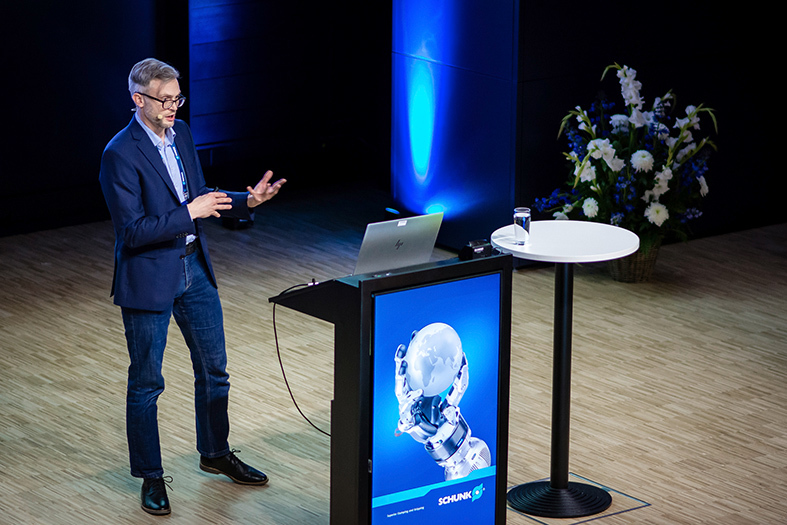 At the eleventh SCHUNK Expert Days on Service Robotics in the automation hotspot of Odense in Denmark, this and other topics were the subjects of discussions involving 170 experts from a wide range of disciplines. The symposium was hosted by Martin Hägele of the Fraunhofer Institute for Production Technology and Automation IPA and Søren Peter Johansen from the Danish Technological Institute (DTI). 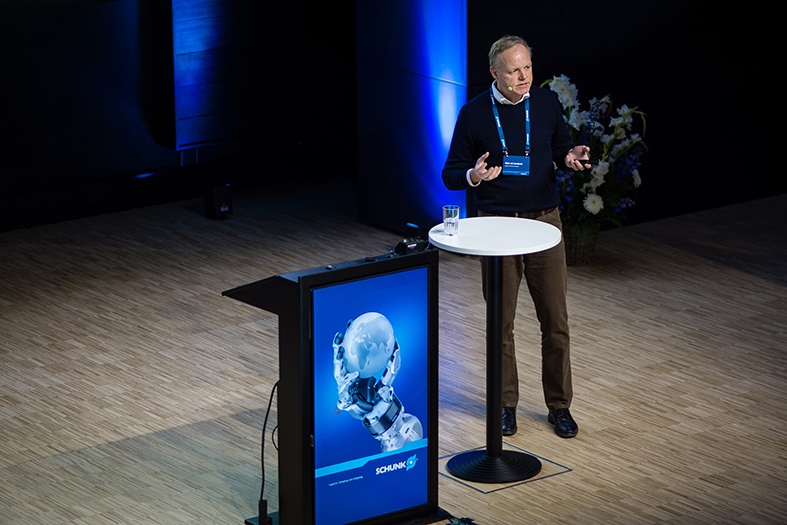 "Towards Open Robotics" was the theme for the 11th SCHUNK Expert Days on Service Robotics. The change currently being experienced by the 180,000 inhabitants of Odense is an indicative one. Whereas in the past the city was mainly characterized by shipbuilding, this is a role now to be assumed by robotics. By 2020, mayor Peter Rahbæk Juel's has set the target of Odense becoming the world's leading city for robotics. Not least due to the success of Universal Robots, the prevailing startup-friendly conditions and the unique togetherness of the city's technological community, which Søren G. Aarhus from Odense Robotics shed some light on, this target ought to be a thoroughly realistic one. Lessons Learned: Networks, partnerships (including those between competitors) and creative freedom are accelerating the progress made in robotics, and removing barriers in peoples' minds. Dr. Nikolaus Blümlein from the LIDL Foundation spoke about some possible application areas for service robots in the area of food and drinks retailing. In their presentations, Prof. Dr. Stefano Stramigioli from the University of Twente in the Netherlands and Wolfgang Ptacek from the Austrian Center for Medical Innovation and Technology illustrated how assistance and service robotics is about more than just technical gadgets and gimmicks. From the diagnosis of breast cancer to autopsies and neurosurgery, lots of medical disciplines will benefit from robotics solutions in the years to come but particularly the affected patients because medical interventions will become increasingly accurate and preventative and diagnostics will be optimized thanks to Artificial Intelligence. Dr. Nikolaus Blümlein from the LIDL Stiftung & Co. in Germany talked about a completely different application area for service robotics, namely the world of food and drink discounters. The challenge here is for robots to come to terms with the particular conditions that prevail in stores when stacking shelves, disposing of cardboard boxes or packing groceries at the checkout. What has already been turned into a reality in large structured warehouses with transport platforms shall in future be extended to the retail sector? The final company tour at the Danish Technological Institute (DTI) demonstrated just how this can be done successfully based on a study that has been carried out. Lessons Learned: Similar to PCs, robots will gradually open up the widest range of application areas in the future, making applications possible that were previously unimaginable. 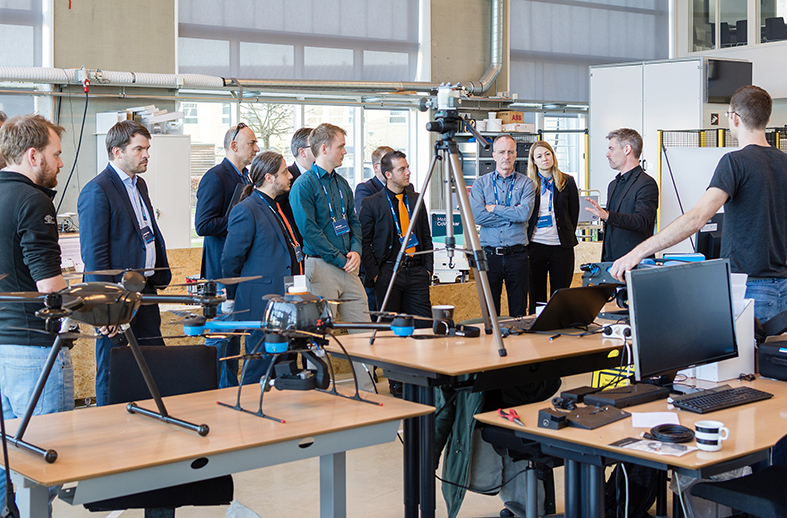 Participants in the company tour at the Danish Technological Institute (DTI) received an insight into current research projects. Particularly in terms of software but also mechanically, some interesting developments can be observed. The presentations by Prof. Dr. Jan Peters from the University of Darmstadt, Martin Naumann from drag and bot, Dr. Klas Nilsson from Cognibotics, Prof. Michael Beetz from the University of Bremen and Prof. Jamie Paik from the Reconfigurable Robotics Lab at the Eidgenössische Technische Hochschule (EPFL) in Lausanne were a testimony to this. All five of these experts shed some light on approaches to how service robots can be programmed intuitively but also optimized mechanically using various Artificial Intelligence methods. The goal here, as Martin Naumann succinctly put it, is quite simply useful service robots for do-it-yourself automation. Similar to in kindergarten or primary school, service robots should learn and train their own motion sequences in simulation environments based on the three stages of observing, imitating and optimizing and then adapt these based on knowledge acquired to new requirements in the real world. In future however this will lead to several challenges that will need solving such as the interaction of force, precision and speed when robot arms or grippers are moved in the direct vicinity of human beings or the flexibility and versatility of gripping tools. Lessons Learned: Both are essential – rapid progress in artificial intelligence as well as suitable mechanical solutions. In the view of Jeff Burnstein from the Association for Advancing Automation, rather than pioneering spirit it is global attention that decides on the market success of service robotics providers. Dr. Walter Wohlkinger from Blue Danube Robotics from Austria and Thomas Pilz, Managing Director of the sensor specialist Pilz, talked about safe interaction between human beings and robots. Two things became apparent in their presentations. A wide range of options exists for the realization of safe applications for human/robot collaboration, from sensor skin for robots to control of motion sequences and sensor-assisted space and gripping force monitoring. Yet human beings will also have to adapt themselves to the behavior of robots. Thomas Pilz pleaded for applicable standards to be adapted in line with developments in service robotics and for critical questioning of when and the extent to which technical safety equipment or instructions makes sense for users. Lessons Learned: Refinement of technology is not the only decisive factor. Training and the possibility of experiencing new technologies in a playful fashion are also important. Finally Jeff Burnstein from the Association for Advancing Automation, Oliver Stahl from Robotise and Niels Jul Jacobsen from Mobile Industrial Robots provided a financial but also ethical view of service robotics. Nowadays China, USA and Europe are all committed to the field of service robotics though they focus on different areas and employ different strategies in implementing this. Jeff Burnstein put forward the view that, whoever has a new technology first is no longer decisive but rather who uses that technology most effectively and thereby generates global attention. When it comes to ethics, Oliver Stahl sees human beings alone as holding all the cards: rather than robots, it is up to human beings to decide what to use technologies for. Lessons Learned: In order for service robotics to be successful, there is still some homework that needs to be done. This is particularly true with regard to intelligence, safety, mapping, clouds and standardization but also when it comes to ethical questions. 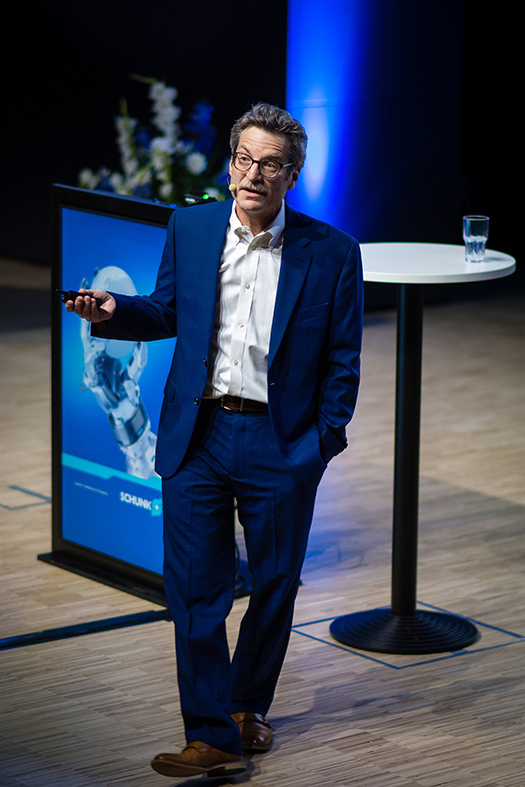 For Henrik A. Schunk, Chief Executive Officer of SCHUNK and initiator of the Expert Days, one thing was clear by the end of the symposium: this was the best SCHUNK Expert Days event so far. Maybe this was due to Odense's special ecosystem or the dynamism that accompanies the topic of service robotics these days. Whatever the reason, the continuation of this series of events next year is already being eagerly awaited. The presentation by Nils Jul Jacobsen from Mobile Industrial Robots looked at the Google Cloud Robotics initiative.